Sparky, that is one of my favorites. That is the best. 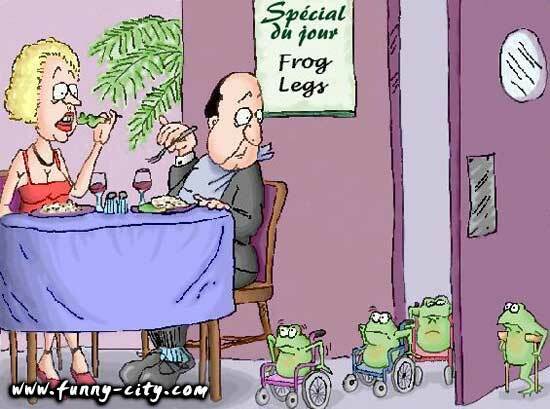 I may never eat frog legs again! The bartender shoved the foaming glass in front of him. "Look," said the customer, "I have no arms - would you please hold the glass up to my mouth?" "Sure," said the bartender, and he did. a man working in a timber yard accidentally shears off his fingers. He runs to the emergency ward and the doctor says 'give me the fingers and i'll see what i can do'. Can we PM about this...?? Bear, I've taken down the questionable post. I know we don't agree on this one, and I hope we can agree on other things in the future. Dave, I've also taken down your quote of the questionable post. Marcia, you were not alone in that assessment.